Needlestick injuries refer to the harm caused by needles that accidentally come into contact with and puncture the skin. This type of injury tends to happen when people use or dispose of needles, which must be handled properly in order to avoid the transmission of infectious diseases, such as HIV, hepatitis C, and other bloodborne pathogens. Needlestick injuries present a special danger for health care workers, lab researchers, veterinarians, and others who work with hypodermics and other related equipment. At Pulgini & Norton, our Boston workers’ compensation attorneys may be able to represent you in a claim if you suffer a needlestick injury. When a contaminated needle punctures the skin, dangerous fluids may be injected into the body. Often, bloodborne pathogens are spread through accidental contact, and even a tiny bit of infectious liquid may spread disease. The risk of infection varies from pathogen to pathogen. Needlestick injuries may also spread diseases involving fungi and other microorganisms. If you suffer an illness due to a needlestick injury that you sustained on the job, you may be able to recover workers' compensation benefits. The workers' compensation system in Massachusetts is a no-fault system. This means that you need not establish your employer's fault in failing to train an employee in how to properly handle needles, or a coworker's fault in negligently handling needles. You will not be barred from benefits because you suffered a needlestick injury due to your own negligence either. However, insurers do deny valid claims often, so an appeal may be necessary. It may be terrifying to receive a needle puncture in a health care context, particularly if you know that a patient has HIV, AIDS, or another illness that may become life-threatening. You should immediately wash the puncture site and obtain appropriate medical treatment. You should also report the injury to your employer. 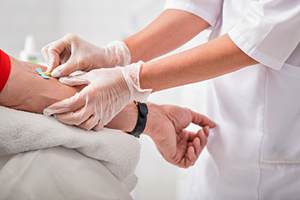 When a needlestick injury happens in a hospital, you will need to determine the infection status of the patient to whose blood you were exposed and get tested for any infectious diseases as appropriate. Even if you do not contract the illness and become disabled due to contracting the illness, you may have medical expenses attributable to the injury that should be covered by workers' compensation. Employers like hospitals, nursing homes, and private medical centers are supposed to carry insurance to cover employees who suffer from work-related illnesses, medical conditions, or emotional disabilities. Insurers may pay benefits even if they are still investigating your claim. You should not assume that they have accepted liability because they pay benefits. For 180 days, called the pay-without-prejudice period, they may pay benefits while still deciding whether to accept or deny your claim. In some cases, they may request an extension to continue investigating. You should not grant an extension before first consulting your own attorney. Health care workers are routinely exposed to the horrors of disease. Knowing how excruciating symptoms of certain diseases are, it may be especially terrifying for them to suffer needlestick injuries. The Boston workers' compensation lawyers at Pulgini & Norton provide legal representation for clients in Brookline, Medford, and Hyde Park, among other Massachusetts communities. Call us at 781-843-2200 or contact us via our online form for a free consultation with a job injury attorney.